Huddersfield Town have equalled the ​earliest ever relegation in Premier League history following Crystal Palace's 2-0 victory at Selhurst Park on Saturday afternoon. The Terriers' defeat couple with wins for Southampton and Burnley confirmed their two-season stay in the Premier League would last no longer, and Jan Siewert's side have nothing but pride to play for in the final six games of 2018/19. Despite their dire situation, Huddersfield impressed during the first 45 in south London, with left back Chris Lowe coming the closest of anyone on the pitch to netting an opener, with Palace goalkeeper Vicente Guaita doing well to deny him on two occasions. ​Crystal Palace also squandered chances to take the lead, as Andros Townsend and Wilfried Zaha wasted great opportunities. Townsend fired wide from close range, before Zaha delayed his shot whilst through on goal before being tackled by recovering defenders. Whilst surviving several clear cut Palace chances during the second half, ​Huddersfield then gifted the home side the opportunity to take the lead as Juninho Bacuna fouled Zaha. 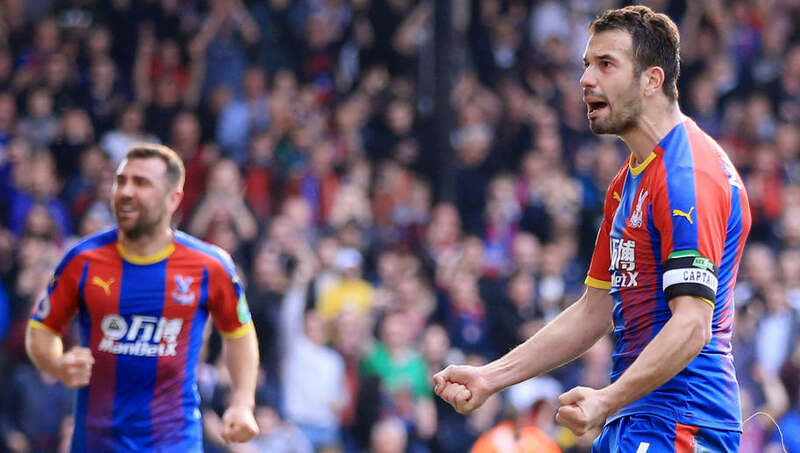 Luka Milivojevic made no mistake from the spot, sending Ben Hamer the wrong way to turn Palace groans into jubilant cheers. Full back Patrick van Aanholt secured the result for the Eagles as he fired under an onrushing Hamer to condemn the Terriers to relegation from the top flight. Here is our breakdown of the encounter at Selhurst Park. Roy Hodgson had warned prior to kick off that it would not be an easy game for his side against Premier League strugglers Huddersfield Town, and he was not wrong. Saha DEFINITELY needs to work on his finishing after today , but a lovely assist to Van Aanholt there! He will however be worried by his team's languid performance during the game, as the Eagles looked way below par against the Premier League's bottom club. The finishing of his forward players was also noticeably poor, as they wasted several chances before eventually taking the lead from the penalty spot. The decisive factor behind his side's victory was the Terriers' slack defending, rather than any attacking brilliance. Star Man - Aaron Wan-Bissaka did not feature during the international break for England Under-21s due to an injury problem, but he looked sharp in contrast to several of his teammates for Palace at Selhurst Park. The 21-year-old registered another typically strong defensive display whilst also looking energetic in getting forward and assisting in Eagles attacks. It would appear as though manager Siewert has set his sights to next season already, as his selection for the game shocked many as the German decided to drop Jonas Lossl, Zanka and Phillip Billing, with the trio vocal in their ambitions to leave the Terriers in the summer. Siewert will be delighted that his side looked far from falling apart without three of their key men, and actually dominated large portions of the match. The German will not be pleased however with the goals that his side conceded, as a clumsy penalty and poor defending cost them in the end in south London. Huddersfield finally relegated. In hindsight, the decision to sack David Wagner may have been taken too early. Also, they return to a competition a squad of such quality deserve. Star Man - How different could Huddersfield Town's season had been if Australian midfielder Aaron Mooy had not missed seven Premier League games through a knee injury? The 28-year-old looked classy within the Terriers midfield, probing with passes as he tried to create opportunities whilst barely losing possession. The Terriers will face a real battle in convincing Mooy to remain with the club as they take a step down to the Championship. Crystal Palace have the honour of being the first Premier League team to play against ​Spurs at the Tottenham Hotspur Stadium on Wednesday night. Huddersfield will still have pride to play for as they face Brendan Rodgers' ​Leicester City next Saturday at the John Smith's Stadium.